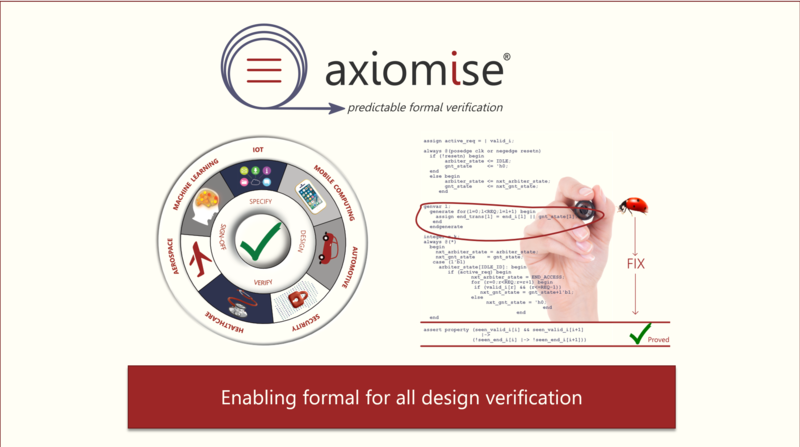 LONDON, June 19, 2018 /PRNewswire/ -- Axiomise®, a formal verification training, consulting and services company announces the launch of a unique formal verification training program focused for design and verification engineers, architects as well as managers across the semiconductor industry. Axiomise was founded in February 2018 by world leading formal evangelist and expert Dr. Ashish Darbari with the vision of enabling formal for all design verification in the semiconductor industry. One of the key ways in which Axiomise will achieve this vision is through the systematic adoption of formal methods which very much rests upon good methodology training which has been a big gap in the industry. To address this, Axiomise has designed a unique industry leading formal verification training program which is powered by world-class expertise at Axiomise. The training is focused on the practical use of formal methods and is an extension to the tool training often provided by the EDA vendors. The training is designed to enable users of formal tools to learn and apply scalable formal verification methodologies to their projects. The training program combines essential knowledge of theoretical principles of validation and verification using formal methods with in-depth training through labs which focus on real life examples derived from practical problems seen by engineers. "The real power of formal is in the hands of the users who often spend a lot of money buying the formal tools but often miss the good methodology needed to obtain scalable and predictable formal verification results. By outsourcing their projects to external consulting companies the end user doesn't learn how to use formal, and as a result, the user base within the organization doesn't grow. Axiomise is excited to share the secret sauce needed for predictable formal verification with its customers," says Dr. Ashish Darbari, Founder, and CEO of Axiomise. The training is fully compatible with all the main formal commercial EDA tools in the market. The training program is targeted towards engineers as well as managers who would like to explore how to deploy formal in practice. The training is customizable and is offered in a variety of options ranging from one-day intensive crash course to multiple days depending upon the preference of the trainees. Axiomise is taking bookings for the training starting from 1 July 2018. Pricing information is available upon request. To learn more, please go to www.axiomise.com or email marketing@axiomise.com. Axiomise has experience of working with all the main formal technologies including theorem proving, model checking and equivalence checking and it offers consulting services in all of these. Axiomise, Axiomise logo, and predictable formal verification are trademarks of Axiomise Limited, UK.